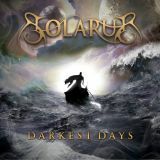 Solarus is a young band from London, Ontario, Canada, that play Symphonic Metal. Darkest Days is their second full length release. I discovered them through Facebook, and then a youtube video for the song Limbo. Which you can watch HERE. The band consists of Sara Dee(vocals), Lucas McArthur(guitar), and the rhythm section of Nick Longe and Mark Feeney(Drums and Bass respectively). As I mentioned this is their second independent release, their first was Reunion, which you can find on places such as Google Play and Itunes. So with a genre full of bands that sound the same, can Solarus bring something us something different? The first thing I noticed was right away after the intro track, Overture(In Tenebras), was how far in front of the mix the guitars are, without being overbearing. McArthurâ€™s lead playing and riffs shines through on My Darkest Days. Sara Deeâ€™s vocals are a little higher then some in this genre without being operatic. She has a strong tone and it does not take long for her to show her range. The aforementioned Limbo is next, and it is a very catchy melodic melody yet can also very heavy. A lead guitar melody is repeated through the song and blends nicely into the songâ€™s guitar solo. If you donâ€™t like softer songs or ballads, then you may not like Holding On, but you would be doing yourself a disservice. Sara Deeâ€™s voice carries the entire song over the minor key being played on the piano. Emotional without being cheesy, powerful and heartfelt, or any other adjective like them would describe her performance on this song. Arrival is a fun metallic filled groovefest, which a huge chorus that builds up nicely from the riffs built in the verses. I know I am repeating myself, but McArthurâ€™s playing is consistently great throughout, and this is one of those songs I remembered after I was done listening to it the first time. Dear Saviour is a dark and melodic song, that starts slow and becomes heavier with a nice symphonic build. Another song that Sara Deeâ€™s vocal range shines and McArthurâ€™s shows his playing is not all shred, and he has a great sense of melody! Embers In The Rain, has an almost melodic death metal style riff to it, and I really like it! This is definitely one of the heaviest tracks on the entire disc, and the band can definitely do more of these songs and I wouldnâ€™t complain! My World has my intro, with some great instrumental playing from all members during the first thirty seconds. A mid to fast pace song at just over five minutes, with a short symphonic break during the last Â¾ of the songs, which provides a nice change of pace. Requiem For The Fallen is the longest song at four seconds short of six minutes. It is similar to the songs that came before it, but without copying exactly what they did before. Ballad number two, is The Final Solution, and much like the previous ballad, it allows Sara Dee to shine. The symphonic instrumentation behind her voice is very well written. There is a build up to the climax of the song just after the two minute mark. Another melodic solo, that while shreds in every meaning of the word, it is also melodic and blends well with the rest of the song. In Memoriam(Immortal), again feels like it is some familiarity to some of the previous songs. It is a good song, like the ones before it, but maybe too similar to the ones that came before it. Overall that might be my only gripe from this release(though I do wish the bass was a little more audible throughout).